Click on the painting to see it in my etsy shop. This entry was posted in fruit, oil, Still Life, Uncategorized and tagged Deb Anderson, fruit, oil painting, orange, Still Life. One of the neighbor kids picked out this leaf for me to paint. The autumn color is really showing now. We’ve had a string of cloudy, rainy days but the sun was out yesterday. I put the leaf by the window and let the sun shine through it. This entry was posted in Still Life and tagged autumn, Deb Anderson, maple leaf, oil painting, orange, red. 10 inches square, oil on hardboard. This has been on the shelf for a couple weeks. I thought it was finished but stalled on posting it. Last night I sharpened up a few edges and blurred others, and I’m much happier now. These blooms have such interesting structures. Nasturtium and smartweed. The garden is a thriving jumble again this year. The girls and I went to Artprize in Grand Rapids last week with my mom. I loved it. If you go, keep an eye out for Tim Lowly’s Bower and Rick Beerhorst’s City as Muse. The girls especially liked Phillip Lynch’s Shimmer and the cotton candy cart. Click on the painting to view it in my etsy shop. This entry was posted in Still Life and tagged Deb Anderson, floral, Nasturium, orange. I got so caught up in the reflections and colors in the bowl. Like glass, reflective metals are a fun puzzle to paint. Is that really what I’m seeing?! I’ve been working with live setups rather than photos lately. I’ve always done some of each. Working from life motivates me to finish – more time pressure since things wilt or droop or get eaten or moved. The paintings I’ve had a hard time finishing are all from photos, and it’s just easier to walk away from, knowing I can come back to it later, but by then the paint is drying and the focus is interrupted. Painting from life has a different look, too. The girls joined me for the painting session last night. I love it when we paint together. Meredith started a scene with a train, but hasn’t finished it yet. Here is Holly’s nest. This entry was posted in oil, Still Life, The Anderson Family Painters and tagged bowl, Deb Anderson, fruit, metal, oil painting, orange, Still Life. With the dry weather and my skimpy watering these nasturtiums didn’t do well this year, but there are a few blooms and some pretty lily pad leaves. I love this orange against the gray background. 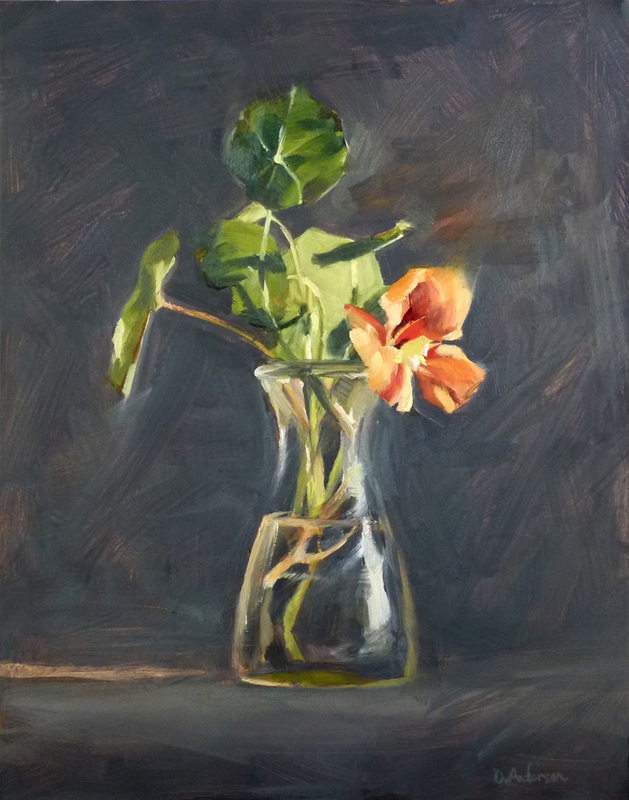 This entry was posted in oil, SOLD, Still Life and tagged Deb Anderson, flowers, nasturtium, oil painting, orange, Still Life. Click this image to visit my etsy site. 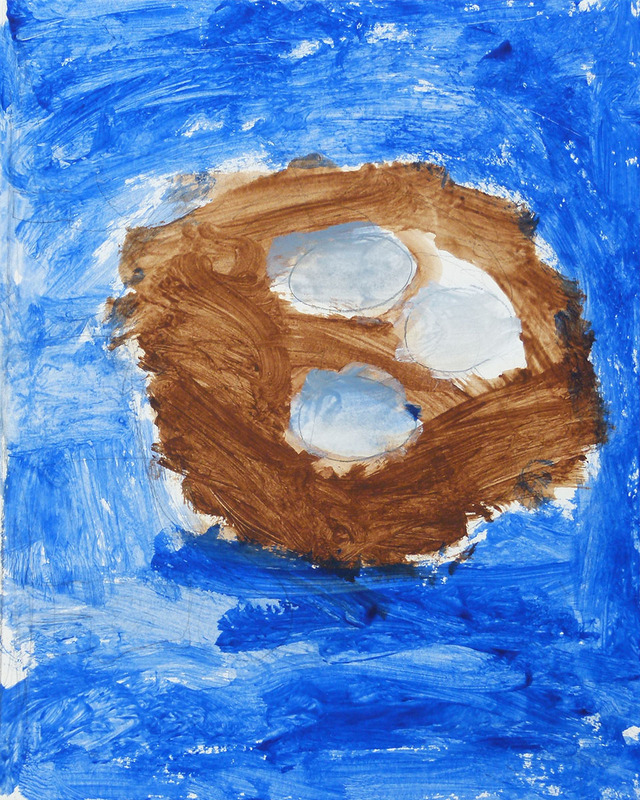 Unless noted, all of Deb's paintings are available for sale.